What is a Time House? 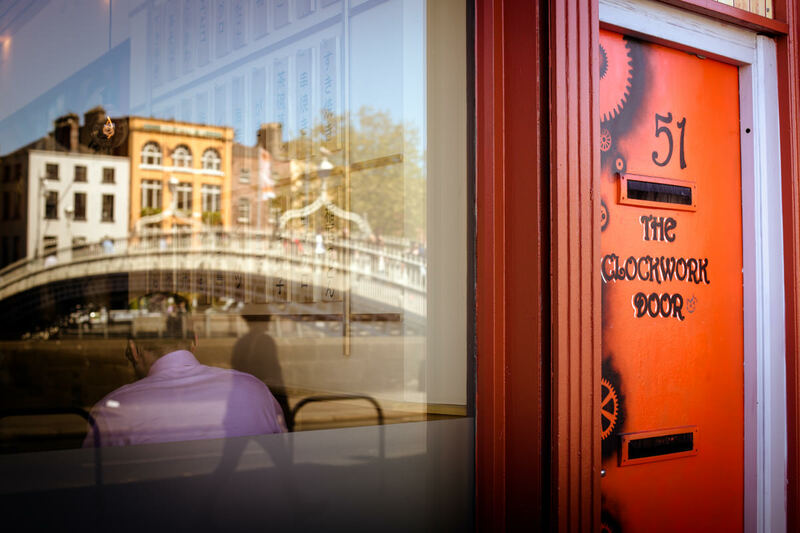 Welcome to The Clockwork Door, the most homely place you'll find in the Temple Bar! We are Ireland's unique Time House - a pay-as-you-go venue where you can enjoy unlimited tea, coffee, biscuits, popcorn and Wi-Fi and only pay for the time you spend here. We are a strictly non-alcoholic venue but you are welcome to bring in your own food (we have a microwave) or get a take-away - pizza, Japanese food, Italian food, you name it! We will happily recommend a good spot for a take-away in Dublin centre. Our Main Room often has something going on, do check out our Events Gallery for information on upcoming entertainment and great ways to spend an evening or meet new people. At all other times the room is essentially a board game cafe - we have a ton of games so bring your friends and enjoy some quality time together! We also host regular Dungeons & Dragons sessions, including beginner events every week. If you want to bring in your own D&D group do let us know and we may be able to offer you a special rate. We have membership options that are worth looking at if you plan to spend a lot of time with us. We can be your study space in Dublin, your get-out-of-the-office lunch spot or just a venue to get together with your friends! Do send us a word if you have any questions or just want to say hi!